“UCLA TO BUILD FIRST ATOM ERA HOSPITAL.” So proclaimed the Los Angeles Times on February 26, 1949. The $15.5-million medical center would serve the campus’s 2-year-old School of Medicine, which had yet to enroll its first student, and would be designed to provide cutting-edge medical care for the whole region. “Construction on one of the greatest medical meccas in the world will begin in the next few weeks at the University of California at Los Angeles,” another Times article gushed on November 30, 1950. In the new “Atomic Hospital,” the story said, the radiology department would shield exposure from powerful X-ray machines by burying them in the basement. Operating rooms would also be underground to improve efficiency and protect against disaster, and would be equipped with observation domes so medical students could watch surgical procedures instead of just reading about them. Medical gases would be delivered directly to double-occupant patient rooms through a central system, not individual tanks. And the massive facility, with 600,000 square feet and 12 miles of walkable corridors, would be flexible enough to adapt to rapid change. “Because this is really going to be an entirely new kind of medical school and research center, we have had to plan it for 50 years ahead of time – for A.D. 2000,” said Dr. Stafford L. Warren, founding dean of the UCLA School of Medicine and former medical chief for the Manhattan Project. But medicine has evolved so rapidly since the 320-bed Atomic Hospital first opened in July 1955 that the gap between it and the hospitals of today seems more like points in parallel realities than two eras separated by scientific advancement. And UCLA is once again at the forefront of a new frontier in medicine. It has taken 14 years, but in June the doors to Ronald Reagan UCLA Medical Center, the first new major hospital of the 21st century, opened to patients. Welcome to the Digital Era hospital. The new facility combines the operations of UCLA Medical Center, UCLA Mattel Children’s Hospital and Stewart and Lynda Resnick Neuropsychiatric Hospital at UCLA in a 1-million-square-foot, 10-story (eight above ground) building at Westwood Plaza and Young Drive South. An architectural masterpiece designed by I.M. Pei and his son, C.C. 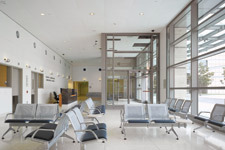 Pei – along with a team headed by Perkins+Will and including RBB Architects Inc. – the new hospital is flush with sunlight, an ultra-fast computer network and a digital attitude. “We have been able to combine high-technology, 21st-century medicine with an environment that is very soothing and comforting to [patients’] families,” says Dr. Gerald S. Levey, who, as vice chancellor of UCLA medical sciences and dean of the David Geffen School of Medicine at UCLA, spearheaded the project. “UCLA medical services and medical school are in a great position to be the preeminent medical provider in the United States.” From installing Internet hook-ups in every patient room, to operating rooms crammed with enough high-tech to turn heads at the Consumer Electronics Show, to a surgical robot that allows physicians to observe and communicate with intensive-care patients from their office or home, Ronald Reagan UCLA Medical Center already is being called the hospital of the future. Take, for example, the operating rooms. The “Digital Hospital” has 23. Everything around the patient – digital-display panels, lights and camera hoods, endoscopic hardware – is suspended on booms hanging from the ceiling to increase mobility and reduce clutter. The ceiling booms are wired for the Internet, enabling a surgeon to involve, say, the overseas physician of an international patient. Flat-panel monitors controlled by the display panels hang from the wall. They cast pre-op X-rays, endoscopic video of the ongoing surgery, patient-monitor data and test results, journal articles related to the surgery, even 3-D reconstructions of MRIs, CT scans and X-rays. When the Atomic Hospital opened, cardiac-care units and CT, MRI and PET scanning didn’t exist. To check for a brain tumor, physicians would inject air into a patient’s spinal column and look with X-rays for the air to fill the head and outline the contours of the brain. Organ transplants were in an infant stage. (UCLA’s transplant program now is among the largest in the world.) Deep-seated cancer was treated with gamma rays from a radioactive-cobalt unit locked behind a 700-pound lead door and three-foot-thick concrete walls. “In 1955, we were in the IBM adding-machine stage; now we are at the work-station stage,” recalls Dr. Dieter Enzmann, the Leo G. Rigler Chair of Radiology. But unlike a desktop computer, technology in the Digital Hospital is portable. Thanks to software developed by two researchers in UCLA Neurosurgery’s Brain Monitoring and Modeling Lab, physicians can study radiological images and bedside-monitor data on any PDA or smart phone registered to the network, which moves files at gigabit to 10-gigabit speeds. Even massive MRIs and X-rays won’t cause congestion. “Our network speed won’t blink when these big images come through,” Dr. Enzmann says. Technology also streamlines responsibilities for nurses. Instead of the long, intersecting hallways of the original UCLA Medical Center, the corridors of Ronald Reagan UCLA Medical Center are loops that connect to the various units on that floor. Nurses’ stations are in the middle, and patient beds are equipped with a button to page nurses, not over the intercom or at the nurses’ station but on a digital phone each carries. Food? Medicine? Pillow? The page tells the nurse what the patient needs. And then there is RP-6, the first ICU robot. She resembles Rosey from The Jetsons, except with a flat-screen monitor for a face and Webcam for eyes. RP-6 also has a name: RONI, short for “Robot of the Neuro ICU.” Until UCLA helped create RONI several years ago, there was a standard procedure for ICU doctors to be awakened at home with word that a patient was crashing. Get up. Get dressed. Hop in the car and race to the hospital. Perhaps 30 minutes later – that is, if the doctor lived close enough to make it through L.A. traffic in that time – he or she was at the patient’s side. Postmodern surgical robots aside, the foundation of UCLA Medical Center laid down half-a-century ago by the Founding Five – Dean Warren, Dr. Charles Carpenter (infectious diseases), Dr. Andrew Dowdy (radiology), Dr. John Lawrence (medicine) and Dr. William P. Longmire Jr. (surgery) – was to advance the School of Medicine. Today’s Ronald Reagan UCLA Medical Center has been built to continue that tradition. Instead of squinting through an observation dome to faintly watch a complicated surgery, the high-resolution cameras in the operating rooms transmit live feeds to an underground conference room. Students can see minute details, thanks to the OR cameras’ ability to zoom into incisions and capture images through endoscopy. Brad A. Greenberg is a writer in Los Angeles. This article is adapted from one that originally was published in UCLA Magazine.